We are an all volunteer program, and nothing we do would be possible without the service of committed volunteers. Community Village Lawrence would like to extend a huge THANK YOU to each and every one of our 60 volunteers who spend time each month making our mission a reality. So far in 2016, our volunteers have provided more than 600 hours of direct support to seniors aging in place! Our current board includes: Chris Holmer (chair), Ellen Paulsen (vice chair), Mary Baxter (treasurer), Mary Johnson (secretary), Diane Adamson, John Hodge, Tamara Cash, Judith Bellome, Brenda Nunez, Susie Nightingale, and John LaRocca. Monthly our 11 board members donate 165 hours of their time. Karen (pictured below, second from the left) and Arnie Johnson (below, third from the left) have been volunteering with Community Village Lawrence since October 2015, when we offered our first trial transportation program. Between the two of them, Karen and Arnie have contributed over 135 hours of service to CVL members—they are two of my our most dedicated volunteers and we’re so happy they are a part of our CVL family! What do you do as a CVL volunteer? We've provided transportation to and from shopping to various stores and doctor visits, removed dead brush from yards, mowed yard, trimmed bushes and trees, pulled weeds, cleaned gutters, washed windows, ran vacuums and scrubbed floors, reorganized kitchens, outdoor sheds and file cabinets, installed safety pull bars in bathrooms, removed, sanded and replaced kitchen cabinet doors. We are grateful that our good health can allow us to provide some help to people in need, and in the near future we may be asking for assistance in many ways. What’s your favorite thing to do for fun in Lawrence? The favorite for Karen is going to dances and dancing with good friends and hanging out with our friends and enjoying the music. Arnie has a band and plays the music for dances, benefits, and private parties and has for more than 40 years. What else do you enjoy doing in your free time? Karen is a proofreader for court reporters and enjoys reading novels and helping at the Friends of the Library and Spencer Museum of Art. Arnie has a love of music and spends much of his free time in his music room listening to and writing new songs. Arnie also mows several yards and does a lot of our housework. 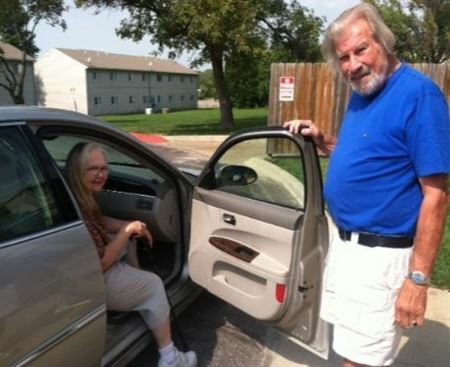 Pictured above: Arnie providing the very first CVL service - a ride for one of our members.